This LGBT History Month, we’ve added lots of great new titles to our Young Adult LGBT recommendation list. 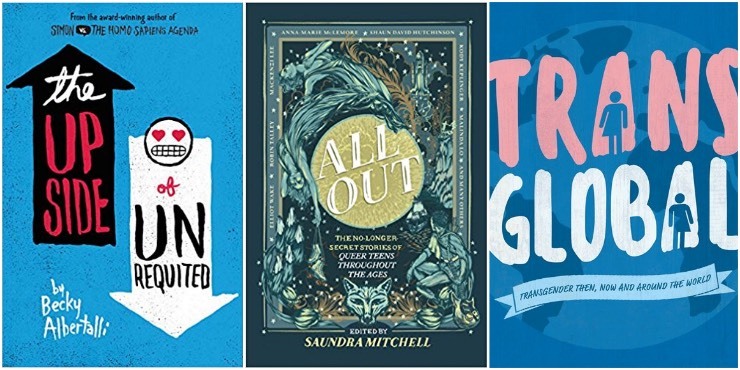 Find your new favourite book here or find even more suggestions on our 2018 Young Adult LGBT list and 2017 Young Adult LGBT list. “Two women are connected across generations through the power of words. In 1955 18-year-old Janet Jones must keep the love she shares with her best friend a secret - in the age of McCarthyism, to be gay is to sin. But when Janet discovers a series of books about women falling in love with other women, it awakens something in her. As she juggles a romance she must keep hidden and a new-found ambition to publish her own story, she risks exposing herself - and Marie - to a danger all too real. “When she was little, Joni used to have dreams that she could fly. But these days her feet are firmly on the ground - they have to be when money’s tight and her dad can’t work and the whole family has to pull together to keep afloat. “17-year-old Molly Peskin-Suso knows all about unrequited love - she’s lived through it 26 times. She crushes hard and crushes often, but always in secret. Because no matter how many times her twin sister, Cassie, tells her to woman up, Molly can’t stomach the idea of rejection. So she’s careful. Fat girls always have to be careful. “Every day a new body. Every day a new life. Every day a new choice. For as long as A can remember, life has meant waking up in a different person’s body every day, forced to live as that person until the day has ended. A always thought there wasn’t anyone else who was like this. A was wrong. “Seventeen, fashion-obsessed, and gay, Abby Ives has always been content playing the sidekick in other people’s lives. While her friends and sister have plunged headfirst into the world of dating and romances, Abby’s been happy to focus on her plus-size style blog and her dreams of taking the fashion industry by storm. “Rafe is a normal teenager from Boulder, Colorado. He plays soccer. He’s won skiing prizes. He likes to write. “And, oh yeah, he’s gay. He’s been out since 8th grade, and he isn’t teased, and he goes to other high schools and talks about tolerance and stuff. And while that’s important, all Rafe really wants is to just be a regular guy. Not that GAY guy. To have it be a part of who he is, but not the headline, every single time. “Take a journey through time and genres to discover stories where queer teens live, love and shape the world around them. “World history has been made by countless lesbian, gay, bisexual, transgender, and queer individuals - and you’ve never heard of many of them. We recommend Mermaids, an organisation that works with families of transgender children.